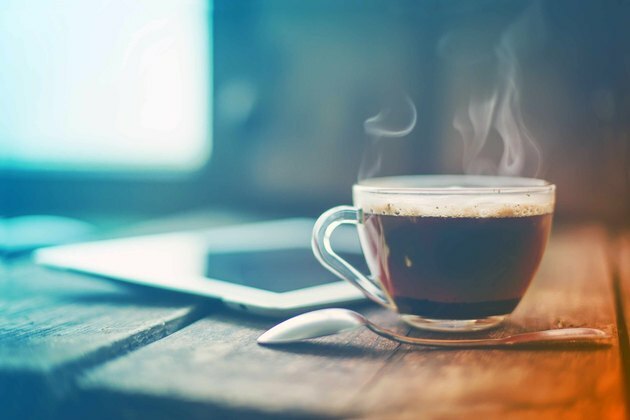 Caffeine, in its various forms, is one of the most popular and widely used drugs and food additives in the world, with around 90 percent of people ingesting it in one form or another, according to the U.S. Food and Drug Administration. It occurs naturally in over 60 plants, such as coffee beans and tea leaves, and it is often added to foods, drinks and medicines. As of August 2011 a link between caffeine and blood clots is currently being explored, because of the former’s effect on blood and heart rate. Caffeine stimulates the central nervous system, affecting the brain and spinal cord, the International Coffee Organization explains. Every individual has a different reaction to caffeine, but generally the main effect is enhancement of alertness. It helps counter fatigue and improves mental performance. However, caffeine may also have negative side effects in sensitive individuals, such as heart arrhythmia, headaches and dehydration. It may also delay the onset of sleep and decrease sleep time, and lead to anxiety, nervousness and irritability. Caffeine can have a significant but temporary effect on blood pressure, as a 2000 study in the American Heart Association’s “Hypertension” journal found. After testing men with and without existing hypertension, the researchers discovered that blood pressure in all groups was raised after ingesting caffeine. However, the effect was much greater in the men who had already been diagnosed with high blood pressure, with a post-caffeine change 1.5 times greater than those with optimal blood pressure. This change, though temporary, may already be enough to cause damage to arteries. Individuals with hypertension should limit their caffeine consumption. Coffee may have an indirect effect on blood clot formation, according to a 2008 study published in the "British Journal of Nutrition." The research team found that coffee inhibits the aggregation of platelets, the colorless, irregularly shaped components of blood that come together to create clots. Clots that form inside blood vessels can lead to stroke and cardiovascular disease. However, it is important to note that it is not caffeine itself that helps prevent the blood clots, but the beneficial antioxidant properties offered by the polyphenol compounds found within coffee. While caffeine itself does not promote the formation of blood clots, it also does not seem to offer any notable benefit for their treatment. However, various other factors may increase your risk for thrombosis and stroke, the World Heart Federation notes. These include atherosclerosis, hypertension, damage to blood vessels due to physical injury, inflammation or radiation, being more than 10kg overweight, physical inactivity, smoking, immobility and using contraceptive pills or estrogen replacement medication.